Just a few things I've picked up in the last few weeks. kimchi pumps from UO, purse from nordstrom rack (scored it for $3! ), and clutch from francesca's in New Orleans. I can't wait to come up with new combinations for outfits. I feel like fall is the "it" season to really experiment with clothing choices. The weather permits you to really dress, not wear the least amount of clothing just because it's insanely hot or dress in ten layers because it's so cold frostbite will ensue. In order to spark my creativity to create new outfits, I have to refresh my memory a bit. Hence the piles of clothes scattered about my room. 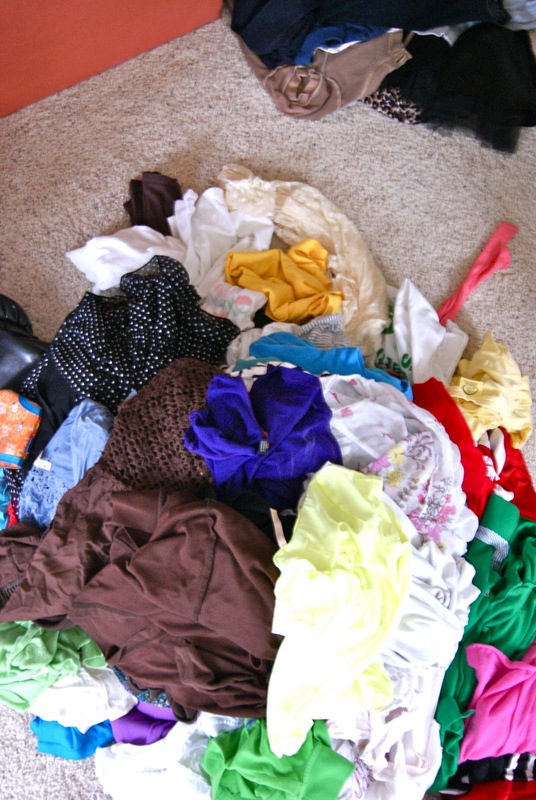 I pulled every thing out of my dresser, separated it all into "yes", "no", and "maybe" piles and VOILA! I have yet to put anything everything away. I like to space out my cleaning time or else I'll go crazy. By the way, did I mention my "yes" pile is substantially larger than the others? I know, I know...what a coincidence.. I enjoyed the comments I got on my reader survey! You all are too sweet, and it helped me get on a perspective on blogging. Basically the gist of it -- blog about what you love, when you want. Sounds good to me! I hope you all have an amazing start to the week. I work the majority, but on friday my sister is leaving for college and I'm helping her move into her dorm :/ It's going to be really weird without her home. Those shoes... TO. DIE. FOR. I havnt commented on here for a while but i have been keeping up with your crazyy life. I am in loveee with those heals you got!!!! Also ive never been to nordstrom rack but if you got that great purse from there for $3 im definitely going to have to check it out. Also im loving all the colors you use in your clothing, im more of a t-shirt and skinny jeans kinda girl myself cause i could nottt work skirts and dresses and what not but i do love seeing you in them, its very inspiring. Im also in the process of redoing my room and your room came to mind cause i remember seeing it in some posts and i love how it resembles you to the t! well sorry for the super long comment, but your very inspirational to me with your fashion choices and the design of your room and basically the way you are who you are, and you dont try to change that for anyone. we arent very close but im going to the new school next year and i hope to see you there!! THREE DOLLARS?????????????????? For SUCH a cute purse! How do you do that, Emily? You amaze me.